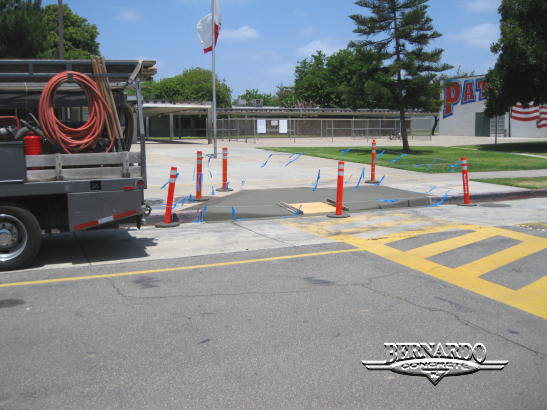 ADA Ramps – Concrete Contractors, Concrete Construction, Concrete Paving | Bernardo Concrete Inc.
Bernardo Concrete was asked by the Garden Grove School District to repair and construct handicap ramps at Patton Elementary School. This campus is located in Garden Grove with surrounding locations such as Anaheim, Buena Park, Cypress and Westminster. Patton Elementary School is one of Orange Counties school’s well known for being dedicated to providing their students with a quality learning experience. We arrived at the job site and began to unload all of the equipment. Once everything was unloaded we began to mark off the area keeping in mind the safety of others. The first thing we had to do was saw cut out the area in order to make a clean edge for the placement of the handicap ramps. Next we picked up and hauled away all the pieces of broken concrete with our unique bobcats and dump trucks. Once the area was completely cleared we started to pour and form the handicap ramp. Along with the concrete handicap ramps truncated domes and 12 inch grooves are inserted especially for the visually impaired. Once the job is complete we at Bernardo Concrete always make sure the job site is cleaned up and looks professional in order to please the customers. 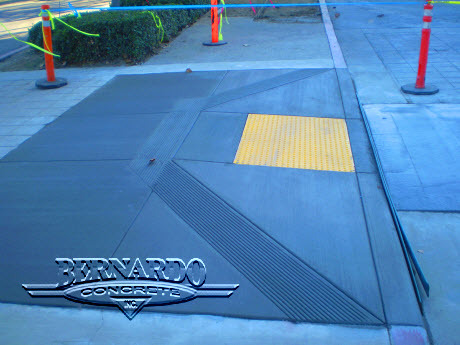 Bernardo Concrete has been installing concrete for 20 years now. That gives us the wisdom & experience of time and we like to think that it shows in our work. We specialize in industrial, commercial, retail and residential concrete services. We are always looking for a challenging concrete construction project to do so, let us know if you have one by calling Toll Free 888-499-0899 . We offer many concrete services including concrete demolition, curb & gutter installation and repair, handicap concrete ramp repair and installation (to ADA code), block wall installation and repair, concrete demolition, core drilling and saw cutting, and many more. There are just too many services to mention all of them so, take a look at our website by clicking on any of the links within this blog. We are located in Orange County California and service the surrounding areas including parts of Los Angeles, Riverside, and San Bernardino. If you have a project that requires a concrete contractor, then give Bernardo Concrete a call today and we will get an estimator out to your business for a fast, free and competitive quote.